Laszlo Cseh (above) won the 100m fly today at the 2015 Hungarian National Championships. Tamas Kenderesi and Lazslo Cseh became second and third men this year to break 1:55 in the 200m butterfly. 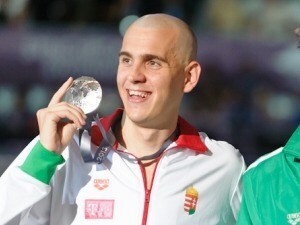 Laszlo Cseh earned his first silver medal of the day with his time of 1:49.09 in the event. Later, he finished second in the men’s 100 backstroke to Gabor Balog by .06 seconds, adding his second silver medal of the day. After watching the butterfliers throw down great times, Daniel Gyurta is preparing himself for a big 200 breaststroke tomorrow. Although the world record holder is most likely not fully rested for this meet, and is using it as a last minute tune up before the World Championships, he is always capable of a big swim. Today, Gyurta posted the fastest time in the semifinal of the men’s 200 breaststroke by four seconds, swimming to a time of 2:10.74. That time is still two seconds off of his season best of 2:08.58 from the Bergen Swim Festival. He was very controlled during the race, splitting 29.63, 33.78, 33.73, and then finally 33.60. Laszlo Cseh earned his second individual gold medal in the meet after posting a 1:59.43 to win the 200 IM. He was the only swimmer in the field to break 2 minutes. Zsu Jakabos also picked up another victory as well. She won the women’s 200 butterfly with a 2:09.38. She was also close two seconds off of her season best time of 2:07.93. To find results from the 2015 Hungarian Open Championships, click here. That 200 breast WR is not long for this world. I don’t think it will happen tomorrow, but I will be utterly floored if that record lasts through Kazan. He needs to work on his first 100, if he can stay with the world record at the 100 mark, it is gone.